Pecan Smoked Hams for sale. Buy online at Zingerman's Mail Order. Gourmet Gifts. Food Gifts. The meat masters at Smoking Goose in Indianapolis start this ham with heritage Duroc-breed pork from Gunthorp Farms in northern Indiana. The pigs are raised out on pasture with plenty of room to root and roam, and they’re never given antibiotics or hormones. The hams are cured with pepper, coriander, mustard seed, honey, bay leaf and Shelby Blue Ribbon Cider, a strawberry-rhubarb cider from New Day Meadery in Indianapolis. Then they're smoked over pecan wood. The flavor is a knockout. Sweet and complex, with a smooth smokiness that lingers long after you put down your fork. The hams are fully cooked and ready to eat right away. Most people simply heat them up and they're ready to be the centerpiece for a big meal. A Zingerman’s exclusive. Boneless, unsliced, shipped frozen and may take a day to defrost. "At an open-house party this past weekend, I served what in the South we call 'Angel Biscuits,' tiny biscuits filled with the pecan smoked ham. The ham biscuits received RAVE reviews. More than one person went home, went online, and put an order in for a ham. Today the ham became the subject of a 30 minute discussion about how it was the best ham eaten in 'can’t remember when.' I received emails and phone calls about the ham. I overheard conversations about how a group could buy several hams, divide them, sharing the cost. 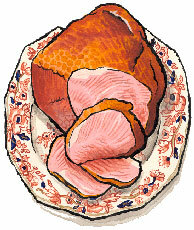 I found all this interesting and a delight….And it really is exceptional ham."